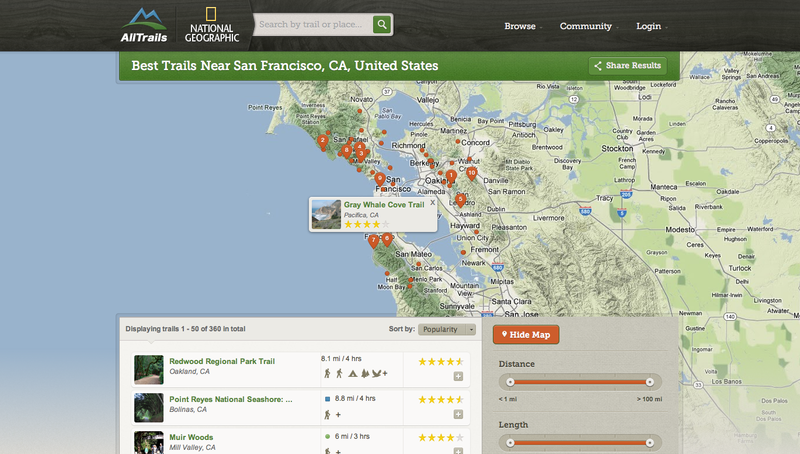 AllTrails, the AngelPad and 500 Startups-backed company working to build the most comprehensive database of hiking, biking and camping trails around the world, is announcing a major partnership today with National Geographic. 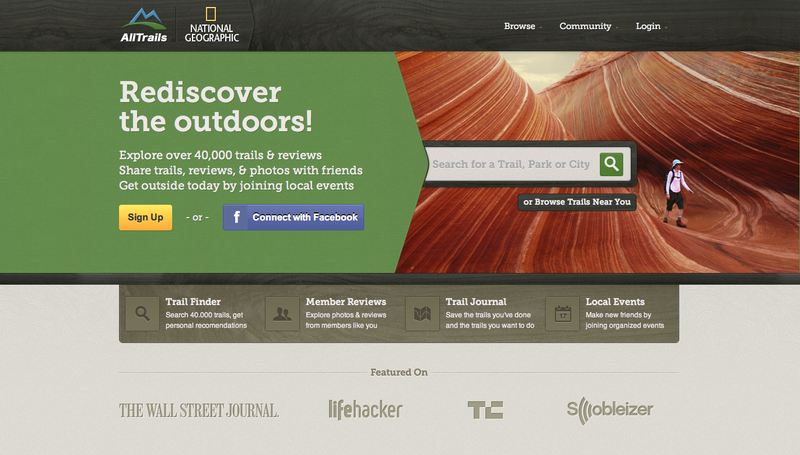 As a part of the deal, the AllTrails website is relaunching this morning with a brand-new redesign built from the ground up, and is co-branded with National Geographic’s logo. According to CEO Russell Cook, National Geographic’s five-year old online property Topo.com, a website that worked with the company’s boxed software, was seeing around 300,000 registered users prior to today’s partnership. But National Geographic was never able to properly develop that resource, so it’s now shutting the site down. Going forward, all of Topo’s traffic will be redirected to AllTrails, and NatGeo will also provide AllTrails with access to its own mapping data. With AllTrails‘ 200,000 users, the combination of the two sites will boost the company’s userbase considerably – up to half a million users. As a part of the partnership, National Geographic has also provided AllTrails with some development dollars, but nothing that can be disclosed. For those unfamiliar, AllTrails was founded about two years ago, with the focus on solving the problem of the incomplete and inaccurate data about spots for outdoors activities. This information is often found in analog format (e.g., guidebooks), but had not been properly digitized or organized on the web. To address the problem, AllTrails pulls in publicly available data and combines it with crowd-sourced efforts in order to build its database of outdoor trails and other activity spots. “The information is out there, it’s all over the place, and you can’t really trust it,” says Cook, of the publicly available data from government organizations in the U.S. like the Forest Service and the National Parks Service. “We go back through it with a team of editors, and a lot of our top users help as well. Any user can submit edits to new trails, then we have a team of editors that make sure it’s accurate before we publish it to the online database,” he explains. Sometimes this process even requires calling up the park in question to determine the data’s accuracy. After building its database for North America, AllTrails participated in the San Francisco-based incubator AngelPad’s first round of startups last year, in order to build its mobile applications. The company now has both iPhone and Android apps, and will offer a mobile website to those on other platforms. Unlike many other outdoor activity maps, AllTrails’ mobile apps intelligently cache content on your device, taking up minimal space, so you can access the maps even when you don’t have a signal. No extra effort is required on the user’s part, either – the app caches content based on your usage of the app, not on explicit commands to download data. The company is now investing its resources in Android development, with the focus on bring the Android app to feature parity with the iPhone app in a few months time. It’s also planning on international expansion efforts, beginning with the U.K., Australia, and South Africa later this summer. 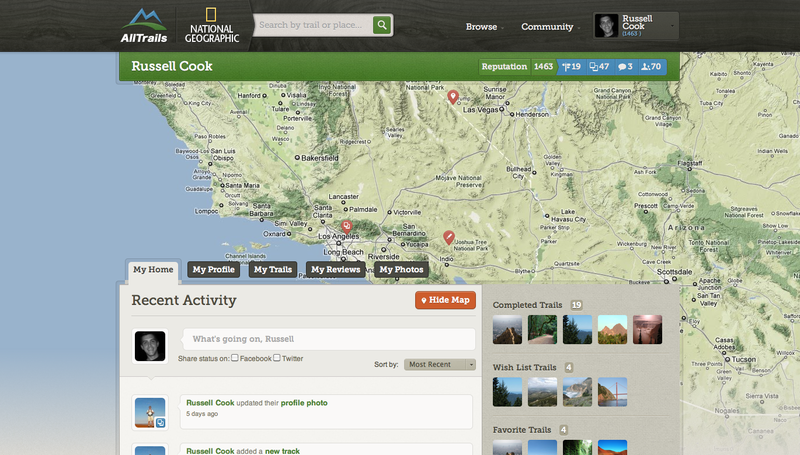 With the new deal between AllTrails and NatGeo in place, AllTrails will be able to launch a paid version of its product for the first time. This will include premium mapping content from National Geographic, GPS routes for trails (available online and on mobile) and discounts with retail partners. These features will roll out next month.